As was pointed out in the introductory part of the present section, filtration of vodka has its own specific features. The main objectives of filtration equipment is to ensure high quality of filtration and long service life of filter elements. As requirements for the products were getting tougher, the need for more effective filtration emerged. Initially it was a simplest system, where filtration was carried out by gravity. However, in spite of simplicity, this arrangement turned out to be very expensive and low-effective, because the pressure tank placed at the height of 10 m can produce pressure of no more than 1 atm. As a rule, the height of delivery in practice was 4 to 6 m, i.e. the pressure was no more than 0.4 to 0.6 atm, whereas the filling line requires constant backwater pressure of 0.5 atm. As a result, a minor plugging of the filter resulted in the standstill and replacement of the filter. In this case one had to choose between two options: either to use a low-effective filter capable of retaining only the largest contaminants and therefore achieve a low quality of filtration, or to use a more effective filter that has a much shorter service life with accordingly increased costs. Increased expenses for expendable materials (filters). To increase the service life of filters and create higher pressures, filtration systems equipped with pumps were introduced. The pump made it possible to increase the service life of the filter, but a new problem emerged, the hydraulic impact. The hydraulic impact occurs when the pressure at the input of the automatic filling unit is much higher than 0.5 atm. This pressure is a sum of the pump output and the pressure produced by the pressure tank. It can achieve 3 atm. As can seen in the figure, the automatic filling unit has the upper and lower levels of liquid. Delivery of the liquid is controlled by a valve. The hydraulic impact occurs at the time of opening or closing of the valve. As a result of the hydraulic impact, a powerful wave travels by the pipe, and the filter receives a blow capable of dislodging accumulated particles that get into the finished product or settle in junctions of the filling line, wherefrom they are washed out into bottles in the form of black dirt admixtures. To reduce the power of the hydraulic impact, the pumps of no more than 2 atm are used in these systems. Also, the systems have a bypass line that is completely open at the time when new filter elements are installed and are gradually closed as the filters are getting plugged. Human factor. As the practice shows that attending personnel does not monitor the degree of filter plugging properly and does not adjust the opening and closing of the bypass line which results in either pressure losses or stronger hydraulic impacts. The next stage in development of filtration equipment was the emergence of systems provided with frequency converters. As can be seen in the figure, this system has no bypass line which is replaced with the frequency converter. 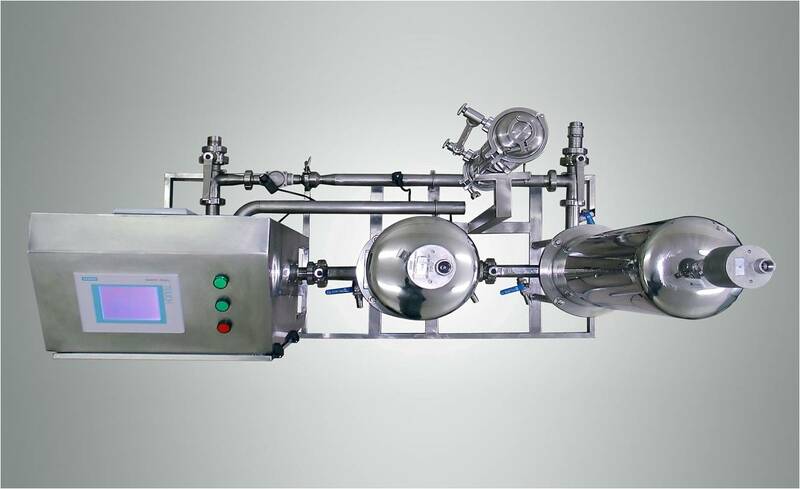 It is coordinated with the filling line and, when the valve is opened or closed, respectively starts up or stops the pump. But in this case the problem of hydraulic impact is resolved only partially: at the time of the start-up, the speed of rotation of the pump is increased smoothly, whereas at the time of closing of the valve in the automatic filling unit the pump is stopped over the course of 15 seconds, which is enough for the hydraulic impact to travel through the whole system. For this reason, a pump of no more than 2 atm is again used. Having analyzed the disadvantages of existing equipment, Technofilter developed a filtration system of the new generation, the Polishing Filtration system of the Absolute-Quality series equipped with an automatic control unit. Achieve greater-than-rated productivity by using a more powerful pump. The automatic unit ensures coordination of the filtration system with any filling line (provided with a mechanical, electromechanical or pneumatic valve). Note: The frequency converter controls the motor of the pump, maintaining constant, user-defined pressure at the outlet of the filtration system. As a rule, this pressure is 0.3 to 0.5 atm. When the valve in the filling line is actuated, a signal notifying the buildup of pressure is sent from the sensor to the controller which promptly turns on actuating mechanisms to reduce the pressure to the user-defined level. The high response rate of the system ensuring effective reduction of the hydraulic impact makes it possible to install the filtration system in filling lines provided with mechanical, pneumatic or electromagnetic valves and guarantees integrity and a long service life of depth filter elements and expensive membrane filter elements. The automatic equipment provides the most suitable conditions for operation of filter elements (smooth start-up, reduction of hydraulic impacts). On orders from the controller, the frequency converter ensures a smooth start-up of the pump. Smooth build-up of pressure ensures integrity of the filter elements. Automatic control of differential pressure at each stage of filtration precludes the possibility of mechanical destruction of the filter package as a result of plugging. The automatic equipment used in our filtration system controls pressure across each filter. If the pressure exceeds a preset level, the filtration system is shut down, sending a message that the filter should be replaced. The automatic equipment makes it possible to use a more powerful pump that ensures full exhaustion of throughput of the filter elements. The throughput of each filter is used completely when the pressure on the filtering layer is no less than 2.5 atm. By using his touchpad, the operator can monitor all filtration parameters in the real-time mode. Note: The starting window of the touchpad displays the filtration rate (m3/hour) and the plugging degree of filters at each filtration stage (%). The possibility of monitoring the service life of filter elements (hours) allows the consumer to select filters with the best price-quality relationship. The use of imported components (controller from SIEMENS, DANFOSS sensors) in the control circuit significantly increases reliability and emproves ergonomic characteristics of the filtration system. The automatic system provided with a PI regulator maintains preset pressure at the outlet of the system. An electromagnetic valve is installed in the bypass line for effective reduction of hydraulic impacts. The filtration system makes it possible to wash filter elements from micronaps in a closed loop. The function of washing filter elements in a closed loop is used when preparing the filtration system for operation and after replacement of filters. When operating in the washing mode, the filtration system precludes the possibility of contaminating the filling line with micronaps. (Note: As a rule, micronaps get into the filtration system during replacement of filters.) The practice of operating filtration systems confirms the need for preliminary washing. The possibility of automatic shutdown of the system after exhaustion of the service life of filter elements is available. 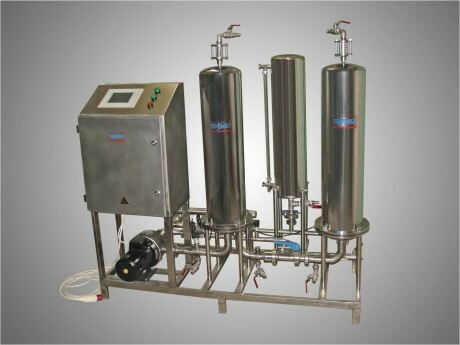 The filtration system is provided with the dry operation sensor. The microcontroller carries out self-diagnosis of malfunctions. Plugging rate of filter elements (%). Pressure at various filtration stages (Bar). Service life of filter elements (hours). control console provided with touchpad, frequency converter, manifold piping, stop valves.